"It isn't rocket science but it sure is fun!" This one would have to be one of the easiest reviews I've had the pleasure of doing. What is there to write about? Not a great deal really. There's 21 games here (full versions) and they all revolve around the premise of solitaire of course. This is an older game and the graphics reflect that somewhat, however the nice thing is that even folks still running a 486 will be able to run the software as long as they have between 2-10mb free. This is sensational as I have come to believe that our older computer users are slowly being forgotten by software companies on occasion. Installation of the games are a breeze and it's a given that there will be something there that appeals to most players. Cards have been given an animated face with some mild sound effects that are not too jarring. 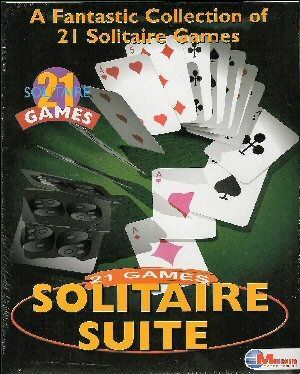 I'd recommend this title to all solitaire enthusiasts as it truly is a comprehensive package compared to a lot of other titles that promise a lot of games that turn out to be shareware. What starts off as a cheap piece of software rapidly becomes expensive as you find yourself buying game after game. This collection changes all that with 21 great games that are going to provide you with many many months of entertainment, possibly even more. At $32.00, this Solitaire Suite is worth every cent and when you also take into account the system requirements, you realise that you truly are onto a winner!